Originally posted to AWNews.org in January 2006 by Syntax. Well here we are, one year to the month since I started this column for AWNews. Unfortunately, lack of inspiration and time constraints have limited it to a bi-yearly release but I am back with some renewed energy (and currently a lot of time on my hands). I have been running around Alphaworld franticly looking for the next target (victim?) for the column and I am happy to report that it has been found. A long time ago in the days of $20 yearly citizenship prices there was a group of citizens dedicated to the preservation and documentation of Alphaworld’s history. This little group was known as the Alphaworld Historical Society (AWHS). If you were to glance down the old AWHS roster, it was basically a who’s-who of the Active Worlds community. You had your Chloe’s and Daphne’s; your BinaryBud’s and HenrikG’s and of course your m0e’s and AlphaBit Phalpha’s (oh come on, what AW organization would be complete without AlphaBit Phalpha?). One name that you probably wouldn’t recognize on that roster would be a citizen by the name of Jdal. He brought the AWHS to Alphaworld with a little gem of a building which will forever be known as the Alphaworld Historical Museum. Museum construction was started in December of 1997 and was modeled loosely after the Getty Museum located in Los Angeles, California. The entire structure which sprawls over a small “man-made” island is about seven structures strong with an extremely interesting network of pathways which interconnect them all. The big selling point of this location is its layers; the fact that it is built directly into the side of this small hill. This gives a visitor the chance to see some extremely impressive views from inside and outside its walls. The official entrance to the Museum will lead you up to certainly the most interesting and useful area of the whole place, the actual museum building. 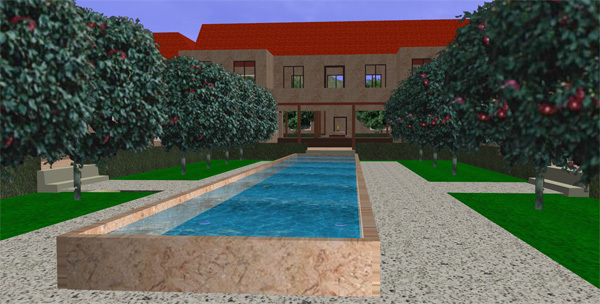 A courtyard with a fountain in the middle is the first sight you will see upon entering the building. Take a walk around the outside edges of this place to view some of the oldest documented screenshots of Alphaworld before heading inside. Now, I really love the inside of this building for one reason and one reason only; the fact that it has content. The content is in the form of very early screenshots (most with mouse-over descriptions and links to the full picture) that are extremely valuable to Alphaworld’s history. Unfortunately, due to the AWHS ceasing to exist as a functioning organization the content in this building only extends up to the early months of the year 2000. Very unfortunate. You can exit this building and continue to follow the winding paths through to the other buildings which are/were owned by organizations such as the Peacekeepers and the AW Events Committee (AWEC) but stand mostly empty and full of broken images. Again, very unfortunate. Looking at some of the dates on the objects, it seems the last activity that took place here was in the AWHS Amphitheater to the west of the island in September of 2002. Aside from a few amateur building mistakes, the place is certainly a stand-out product of the 1997-1998 era and deserves a lot of credit. Although, one thing that really ruins the experience for me every time I visit is that the building is not complete; the entire north and east sides of the island are unfinished and floating in space. Come on, if you are going to start a big community project like this, the least you can do is finish it. This is a building that is supposed to be a monument for the entire community of Active Worlds. Inactivity and incompleteness were the major factors contributing to the score I am giving to the Alphaworld Historical Museum. The main museum building and the content within it are the plus-side to this place and are definitely worth a look to anyone interested in the history of the world.